The month of May has come to an end and so has the Facebook Focus part of the blog. One of the things I wanted to do was to make you aware of how wonderful and positive an experience it can be. However many of us are dragged into the games and we just click away wasting time. Some days that can be what we need but unfortunately most times it takes us away from other more productive things we could be doing. Lets start by looking at the information gained from the poll that was posted. Most of us joined so we could be closer to friends and family. We have been members for 6 months to a year. An overwhelming majority have about 200 friends with at least 25 of them we have no idea who they are or how we found each other. My guess it is to be neighbors in some silly game. Over 80% of us play at least one game on Facebook and 100% have considered quitting it. Most of us spend 2 to 3 hours a day on the site. I joined Facebook for marketing and to be closer with friends and family. I got dragged into Farmville and have taken a few friends with me. 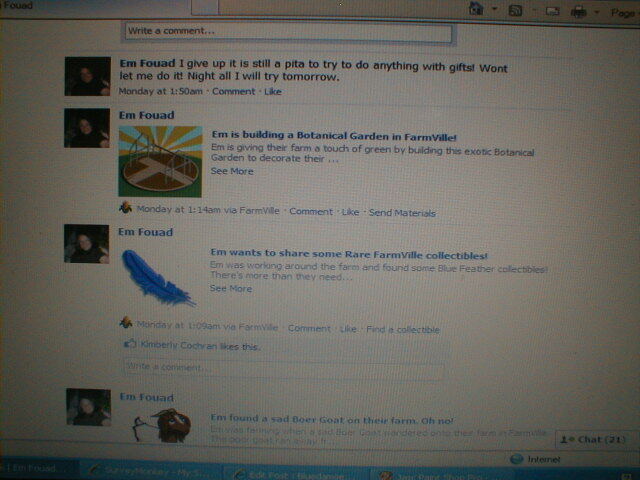 I have had fun at times playing Farmville. One of my fondest memories is going to a close friends house to play Farmville. The first time there were three of us on our laptops and we were joking and laughing while playing. Just getting set up was a riot trying to find enough electrical outlets so we all could plug-in was a group effort that had us laughing at ourselves and technology. With one story of an older person who was playing and kept storing her items in her barn without realizing what she was doing we were laughing so hard I literally almost pissed my pants. Then there were the times when hubby would be in one room and shout out “Do you need cowbells? I just found an extra stash of them”. There were times that we would synchronize the trading in of valentines, gold, or eggs so the other could benefit. There were times when hubby would see something that was being offered by someone and remark that he did not have a chance to claim because so and so or someone else was online. We laughed at times when things in life had us thinking that maybe we would not be able to find humor in anything. We had our son telling us more than once that we needed to get a life because of Farmville. I have not been tending to the farm, or sending and claiming gifts because I have realized just how much time I wasted on that silly silly game. I do every once in a while use a farm hand to take care of all the animals, I guess it is nostalgia and me knowing that if I do delete the game I will not have a chance to experience these silly moments again. Some of them were fun but honestly most seem like another job which I do not need in my life right now. So to my Farmville (or insert your favorite game here) friends I am not really playing anymore because I just have other things I would rather do with Facebook than waste my days on games. If you too would like to quit being a slave to games just don’t click…..go for a walk, read a book, scream at your kids or hubby, take a nap. Do something you love instead of being a slave to a game that in the whole scheme of life does not matter. GET AND STAY PRODUCTIVE!!! And remember how many clicks it takes to play your game and how you could be clicking for a more productive cause. I am gearing up for the next clay swap if you want to check it out come on by the Yahoo Group……. This entry was posted on June 7, 2010 at 1:17 AM and is filed under "city o clay", Polymer Beads, polymer clay. You can follow any responses to this entry through the RSS 2.0 feed. You can leave a response, or trackback from your own site.